STEINER'S TSXi 5-25x56MM IS A SERIOUS PIECE OF EQUIPMENT. When I received an email from our editor while he was on location filming the "Handguns & Defensive Weapons" show, I knew something was up. He'd had the chance to shoot Steiner's new T5Xi 5-25x56mm tactical scope out to 500 yards and was sufficiently impressed to be able to pirate the sample he'd shot and rush it to me for review. When I received the Steiner T5Xi 5-25x56 for review I could see the reason for his enthusiasm. It was indeed an impressive-looking optical device with "Germany" boldly marked on each side of the eyepiece. The question, of course, simply being would its performance live up to its European street address? I was initially skeptical when Steiner first introduced a line of riflescopes, but when I took an early look at them, my impressions were positive, and I eager to see how the big T5Xi 5-25x56mm performed. I am a fan of optics in this magnification range because they cover both near and far when mounted on a typical precision rifle. You can take close shots on 5X or crank up the magnification and have a look about on 25X. Plus you have everything in between. That uber-fat 56mm objective lens isn't just for looks, either. Low-light performance ofscopes in this class can be quite impressive. The trade-off is size and weight. Unlike the other European optical giants such as Carl Zeiss, Hensoldt, Meopta and Swarovski, Steiner made its name building Porro prism binoculars. I was initially skeptical when Steiner first introduced a line of riflescopes, but A German company, Steiner rose to prominence from the ashes of the Second World War. Founded by Karl Steiner in 1947 as a small "one man shop," it has grown to become a supplier of the U.S. and many other militaries. Important technological innovations made by its engineers include rubber armoring, the first binocular with an integrated compass and special optical coatings to protect against UV radiation. Now that I've worked with one, Steiner riflescope has impressed me more than its binoculars ever did. 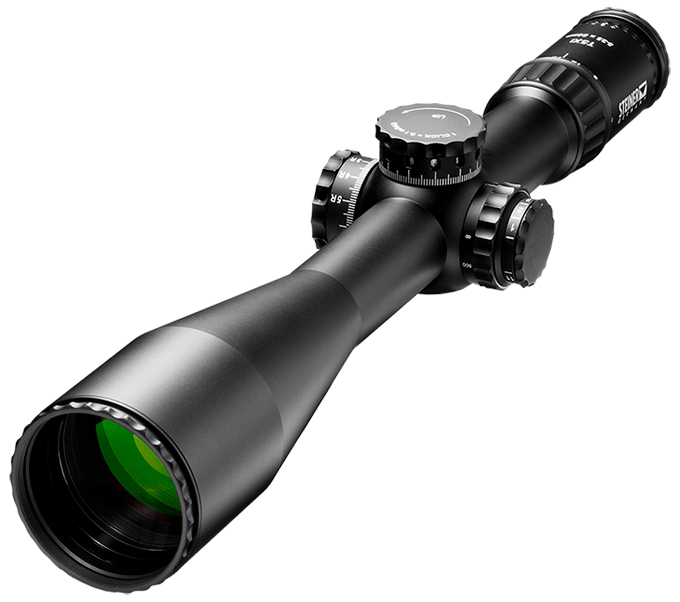 The Steiner T5Xi 5-25x56mm SCR reticle scope 5122 is an attractive tactical scope, without being "too" German. From the fat 56mm objective to the sculpting on the fast focus diopter eyepiece, it's designed to be both functional and good looking. More to the point, Steiner has recognized that American riflemen often have distinctly different tastes than their European counterparts, and it has developed a sight with the features American shooters will appreciate. I was initially skeptical when Steiner first introduced a line of riflescopes, but The heart of the scope is a five-times magnification increase lens system housed inside a 34mm tube. A five times magnification-increase is a small but useful step up from the traditional four-times designs, while being less expensive and complex than comparable six-times designs. Magnification runs from 5X up to 25X in a 180-degree twist of the zoom ring. The magnification ring markings are angled for better visibility from behind the rifle. A "cat tail" allows rapid magnification adjustments but is easily removed if you don't like it. The mechanism block sports two large-diameter, low-profile turrets for windage and elevation. These feature 0.1 mil adjustments with audible and tactile clicks. A full turret revolution provides 12 mils of adjustment with 26 mils of elevation adjustment available. The elevation turret has the typical hash marks to keep track of adjustments, but it has an interesting trick up its sleeve as well. The full mil markings on the turret can be seen through small windows, after you go past a full turret revolution the numbers change to reflect this. The first time you rotate the turret on the Steiner T5Xi 5-25x56mm SCR reticle scope 5122 and see the numbers change, you'll stop and do it three or four times while thinking to yourself, "Neat." On the left side of the mechanism block is a paired knob. The smaller outside knob is a rheostat that controls the intensity of the illuminated reticle. | It features 11 powered settings with Off positions at each end and in between each powered setting. This allows use with night vision devices, in low light as well as in daylight conditions. Power is provided by a CR2450 battery. The larger inner knob adjusts parallax from 50m to infinity. Both knobs adjusted smoothly with the rheostat having easy-to-differentiate clicks on the Steiner T5Xi 5-25x56 with SCR reticle. My review scope came fitted with Steiner's Special Competition Reticle or SCR. This is a mil-based design developed to provide both the ability to range targets and provide ballistic compensation. As the reticle is mil based, it is not caliber/load specific and can be used with any caliber or load. Located in the front focal plane, it features 0.5-mil holdover marks on the vertical stadia and 0.2-mil hold-off marks for windage on the horizontal stadia. The design also incorporates 0.1-mil marks for ranging. "Steiner's T5Xi 5-25x56mm scope is the perfect complement to a high-end rifle, and the SCR reticle is a mil-based design that provides ranging, holdovers and wind holds". 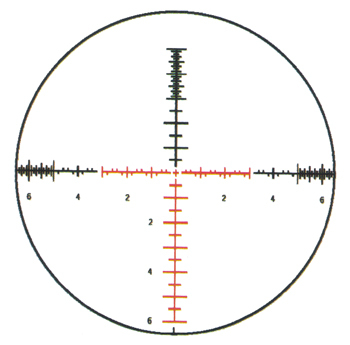 As the reticle is located in the front focal plane, it can be used for ranging/ballistic corrections at any magnification. I found the Steiner to possess excellent optical qualities. Color rendition was accurate, resolution was good, and the image was bright and clean. The eye-box was forgiving regarding head placement on 5X but not so at 25X. Adjustments were both consistent and accurate. I liked the size, height and design of the turrets. The reticle also worked well—relatively simple and straightforward to use without clutter. I found the T5Xi much to my liking. Optical performance on the Steiner T5Xi tactical 5-25x56, especially in low-light conditions is very good. The controls all operate smoothly, and the scope provides a certain pride of ownership. Practical performance either off the bench or lying prone in the field was excellent. The T5Xi would be right at home on a .338 Lapua bolt gun or a .260 Rem. AR. Downside is it's fairly long, has a fat objective and weighs in at 33 ounces. 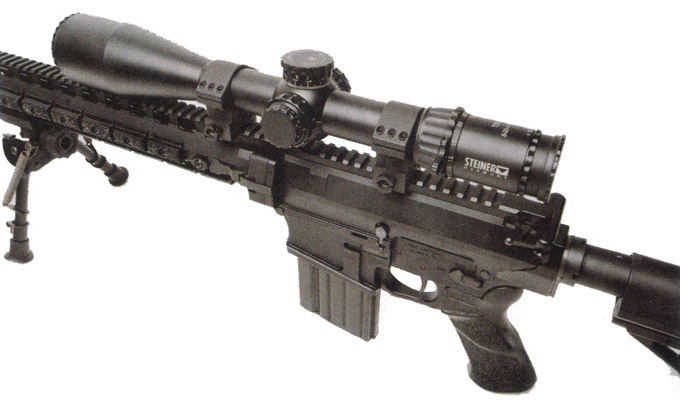 All in all, I was impressed by Steiner's T5Xi 5-25x56mm SCR reticle scope. Performance was excellent, and I had no problems with it. Price is a bit hefty at $2,000, but if you can afford it, it's one to consider for your precision rifle. Tactical Survivalist has the Steiner T5Xi 5-25x56 for sale at an excellent discount price.